It's fruit season! To celebrate, I bought two peaches at the store a few days ago. And yesterday, they were finally ripe enough to eat. Well, at least one of them—so I did! I turned a juicy little peach into a fairly substantial lunch with little to no effort. Heat a small pan on the stove over medium heat. Slice the peach in two and remove the pit. When pan is hot enough, place the peach halves face down in the pan. No oil or butter required! 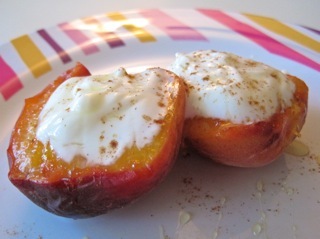 Flip after two minutes, repeating the process until the peach is heated through, then remove both halves from the heat. Place them skin sides down on a plate, then fill each pit indentation with a scoop or two of the yogurt. Drizzle with honey and sprinkle with cinnamon to taste. And then—enjoy! Feel free to finish off the carton of yogurt, too. It'd be a shame to waste all that protein and calcium. And the peach itself is a great source of fiber, which means it'll help out your digestive system. One quick note, as I enjoyed my peach, I couldn't help but wonder how it would taste with a sprinkle of chopped nuts or a scoop of granola. Or maybe some blueberries. Heck, I even wondered what they'd taste like with low-fat ice cream in place of the yogurt! There are just so many ways you could vary this tasty guy. And if you do, let me know how!